Shouldn’t every member of your family have health insurance? Your browser does not support HTML5 video. Please try loading this page on a latest version of browser. A jump off the couch or an unexpected illness can put a dent in your wallet, even when the patient is your pet. A torn ACL can cost about $3,300 to fix. Cancer treatments can easily run $5,000. Even a routine vaccination costs on average $270. So shouldn’t every member of your family have health insurance? Insurance protection by one of the nation’s leading pet insurance providers: Nationwide. Nationwide Pet Insurance, formerly Veterinary Pet Insurance, was the first company to recognize the importance of pets as valuable family members and had similar care needs. That’s why it was the first company to introduce pet insurance in 1982. Instead of using a benefit schedule, My Pet Protection and My Pet Protection with Wellness reimburse a straightforward 90% of your vet bill. A $250 annual deductible and $7,500 maximum annual benefit apply to both plans. How can this help me? Also covers procedures and services including surgeries, Rx medications, testing and hospitalization. My Pet Protection covers so much, it’s easier to tell you what’s not covered. Click here for our helpful flyer. Everyone is eligible to receive preferred pricing on American’s #1 pet insurance! ANYTIME! Most policies have a 14-day waiting period once your application is approved and we receive payment. If you’re paying by payroll deduction, please contact your employer’s benefits administrator for details on effective dates. How much will this coverage cost? Thanks to your employer’s group rates, you’ll pay less for this coverage than you would for individual coverage you’d find on your own. Click “Get a Quote” and based on the information you provide, you can receive an immediate quote. If I leave my employer, will I be able to keep my coverage? When you leave or retire from your current employer, you can continue your coverage without interruption, subject to applicable law and the policies' terms and conditions. Although payroll deduction will no longer be available if you retire or leave your company, you can opt for other payment methods such as direct checking or bank account deduction, credit card billing or home billing. Higher rates may apply. With Nationwide, you’re free to use your choice of veterinarian (no pre-approval necessary) - worldwide including specialists and emergency providers. Flexibility: Nationwide’s plans are licensed in all 50 states. Savings: Receive discounts when enrolling multiple pets - up to 5%, 10% and 15%. Extras: Through our vetHelplinesm, policyholders receive live veterinarian guidance 24/7 about their pet’s health, from general questions to identifying urgent care needs. In addition, policyholders enjoy discounts on pet products and services, a newsletter, online support and more. Once I enroll, how long before my policy is effective? Most policies have a 14-day waiting period once your application is approved and we receive payment. If you’re paying by payroll deduction, please contact your employer’s benefits administrator for details on effective dates. When/how can I cancel my coverage and when would it take effect? You can cancel your coverage at any time by contacting Mercer at 855-290-5661 or selecting the current benefit elections option at www.BHBenefitsplus.com, logging in, the declining the benefit. The cancellation would become effective the date of the request and you could re-enroll at any time. If payroll deducted, your first or second paycheck after the cancellation is processed would reflect the change and a refund should be issued by Nationwide within 30 days of the date the cancellation is processed, if applicable. What if my pet currently has an illness? That’s a pre-existing condition, which is any illness or injury your pet had before coverage started. While no pet insurer covers pre-existing conditions, the good news is that Nationwide doesn’t permanently exclude all such conditions. If you have medical records from your vet showing that your pet’s condition has been cured for at least six months, you may be able to get it covered. Will you drop a pet from coverage because of age? Never. As long as your pet is enrolled before age 10 and you keep your policy continually in force (translation: don’t let it lapse or expire), we promise not to drop your pet. Are medical records required for enrollment? Not always. Sometimes we request medical records for clarification so we can ensure you receive all the benefits available under your plan. Does my pet insurance policy cover diagnostic testing? Yes. We reimburse for diagnostic tests as long as the medical condition is covered by your policy. Are anterior cruciate ligament (ACL) injuries covered by my policy? Nationwide covers ACL injuries that are diagnosed after you’ve had your policy for 12 consecutive months. And unlike many other pet insurers, we cover both knees. What if I don’t know my pet’s exact age? No problem. Just take your pet to the veterinarian for a physical exam that includes an age estimate. Are prescriptions covered under my policy? Yes. FDA-approved prescriptions for covered medical conditions are eligible for reimbursement. Is there a list of veterinarians I have to use? Nationwide, you’re free to visit any veterinarian, anywhere—even specialists and emergency providers. Pay your veterinarian at the time of treatment. 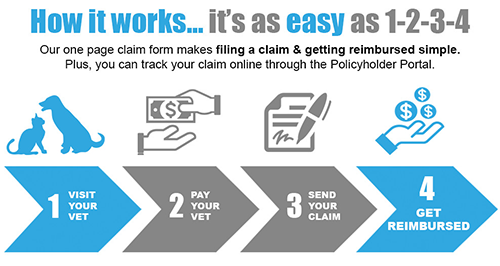 Submit your claim via fax, email or the free VitusVet app (available for Apple and Android devices). We take it from there. We’ll process your claim and send your reimbursement right away. How does my veterinarian receive payment? You pay your veterinarian directly and then submit a claim to us. We’ll adjust your claim and reimburse you according to your plan. What is Vet Helpline and how does it work? Vet Helpline is a free service for all our members. Live veterinarians are available 24/7 to answer general pet questions and help identify urgent care needs. A Vet Helpline consultation is not a substitute for a visit to your primary vet. *Some exclusions may apply. Certain coverages may be subject to pre-existing exclusion. See policy documents for a complete list of exclusions. Our fast and easy enrollment process means you can start protecting your pet sooner. Details of Mercer disclosure of the compensation.